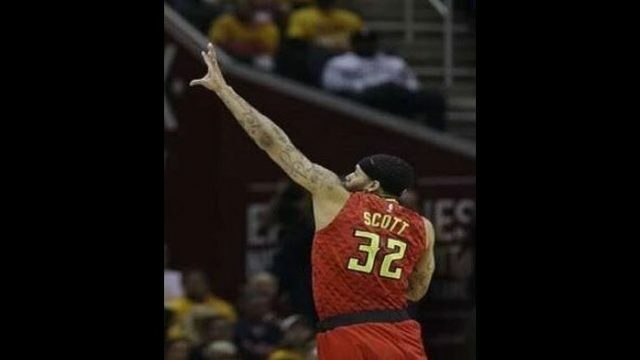 BANKS COUNTY, Ga. – Channel 2 Action News has learned one of the deputies involved in the 2015 arrest of an ex-Atlanta Hawks player has been placed on administrative leave, while the department seeks funding for dash cameras. The Banks County Sheriff confirmed the move to Channel 2’s Nicole Carr on Thursday, less than a day after the state dismissed a felony drug case against NBA player Mike Scott. The dismissal was based on a lack of probable cause and a determination of racial profiling. Court records show Deputy Brent Register described a chase that never took place when he and another deputy arrested Scott and his younger brother Antonn Scott along Interstate 85 in Banks County in July 2015. Register testified he went after Antonn Scott for driving too closely behind another car, and alleged Scott led him on a two-mile chase that reached speeds of 98 miles per hour. But towing and dispatch records indicate there was never a chase. All the vehicles came to a stop within twelve seconds of Register turning on his blue lights. The records also show the brothers’ rental car was towed from mile marker 154, two miles ahead of the place Registered testified the non-existent chase ended. The courts also questioned Register’s credibility based on prior issues in previous departments and his recent arrest records. They noted more than 75 percent of his arrests in the past year were of minorities, while Banks County is comprised of a 93 percent white population. Carr pulled Register’s police certification records that classify him as being Hispanic. Weiner said the Scott brothers were headed home to Virginia in a rental car, and Mike Scott was sleeping during much of the incident. A second deputy met Register to arrest the brothers before searching the car. “Within 10 seconds, there are two officers one on each side of the car, with weapons drawn, telling them to get out,” said Weiner. Mike Scott admitted to having marijuana in the car when asked about drugs by deputies. Police said they seized more than an ounce of marijuana and 10.9 grams of the drug known on the street as Molly. Sheriff Speed told Carr he didn’t get a chance to see the 300-page case file until Wednesday evening, after Superior Court Judge Currie Mingledorff made his ruling. That’s when Register was put on admin leave pending the department’s internal investigation. On Thursday morning, Speed went to the County Commissioner’s budget meeting and requested $50,000 worth of dash cam equipment for his small department of 65 paid employees. Less than half of them are sworn officers. “(It’s) So we can have them in the future because they’re being brought into question by the courts,” said Speed. Speed said all of his officers go through biased-based training, and he does not believe his department has a racial profiling issue. He wants the public’s trust.